Touch panel displays are ubiquitous. It is difficult to imagine using smartphones, personal computers, digital watches, and other modern electronic devices without this form of human-device interface. However, despite the proliferation of touch panel devices there is increasing research on the next generation of 'man-machine' devices, which could be worn like clothes, so called wearable sensors." Now, in an innovative approach, Yoshiro Tajitsu of Kansai University, Osaka, Japan, and Teijin Limited, Japan, have developed the world's first wearable piezoelectric fabrics consisting of a conducting carbon fiber yarn core; piezoelectric polyctric poly-L-lactic acid (PLLA) fiber yarn and polyethylene terephthalate (PET) middle sheath; and conducting carbon fiber outer shield (Fig.1). "Our research is aimed at developing functional apparel, sometimes referred to as 'e-textiles,"" says Tajitsu. "We believe that wearable human-machine devices will enable people to interface with external devices naturally, without being limited or hindered by having to perform complicated movements, such as focusing on a display panel to rely instructions. Also, 'e-textiles' must be comfortable and fashionable for wide spread acceptance. These ideas led to the development of our wearable sensors shaped like traditional Japanese braided cord or Kumihimo used in Kimono." 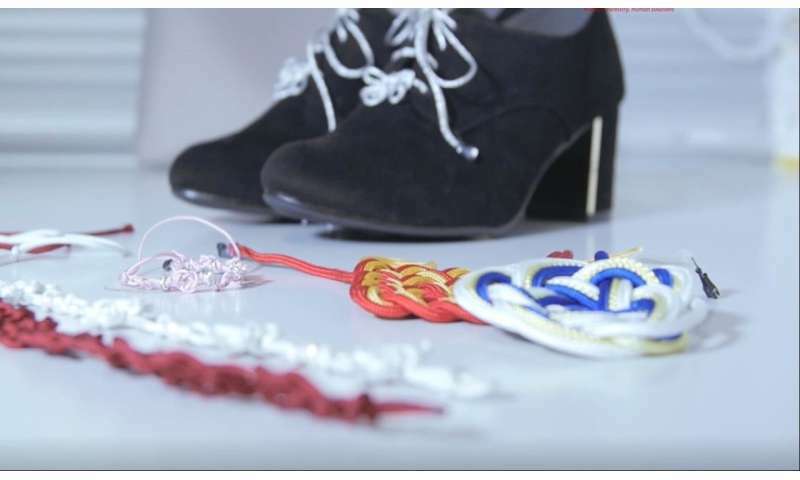 Professor Tajitsu and colleagues weaved three types of traditional Japanese decorative knots (Kame, Kicchyo, and Awaji) used as part of traditional Kimono's worn by women (Fig.2) with PLLA braided cords. "We analyzed the magnitude of electrical signals that we could expect for each of these three knots," explains Tajitsu. "Our finite element calculation showed that he largest signal would be produced by the Kame and Kicchyo knots, and that the response from the Awaji know would be very small. So we use the Kame and Kicchyo knots for potential applications." 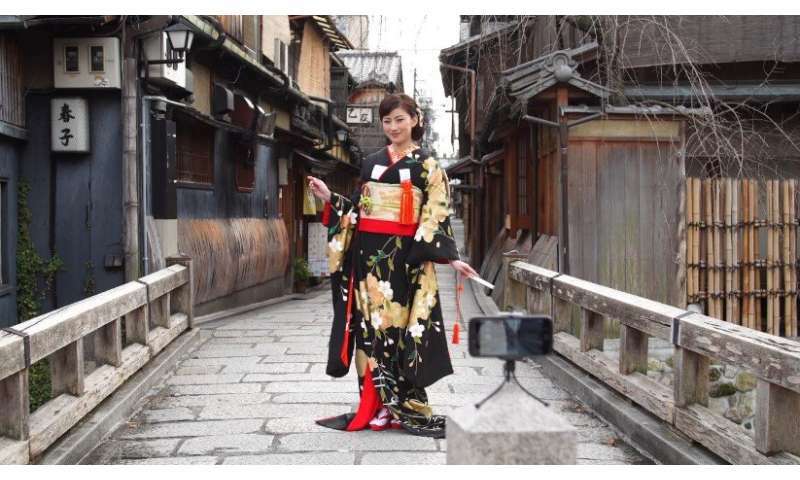 One of the unique wearable applications is for Japanese Kimono's (Fig.2), for example to trigger a smart phone to take a selfie. "We are working with fashion designers in France and Italy of the design of clothes made with our PLLA braided cords," says Tajistu. "We are looking into possibilities for traditional Japanese clothing like women's Kimono with partners in Japan." The piezoelectric PLLA braided cord can be used as wearable sensors, mainly in the fields of fashion, sports apparel, interior design, and healthcare, by utilizing its fashionability and wearability, which cannot be achieved using conventional wearable sensing devices (Fig.3). 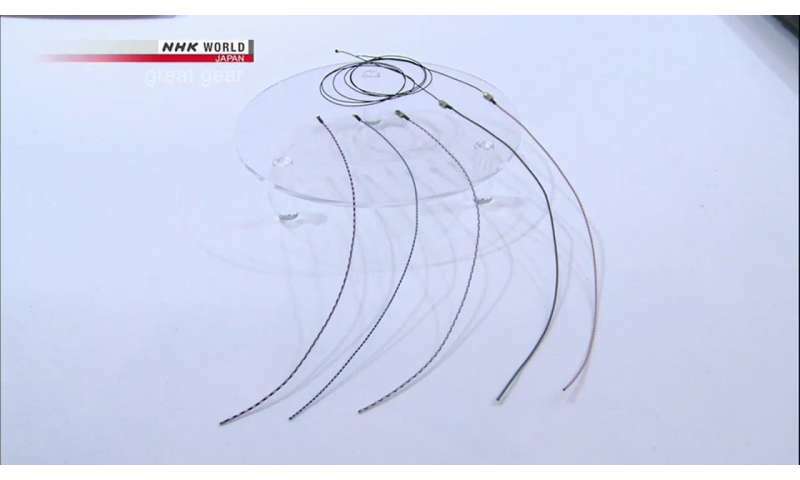 Healthcare and monitoring the motion of people are other potential applications of the PLLA braided cords. 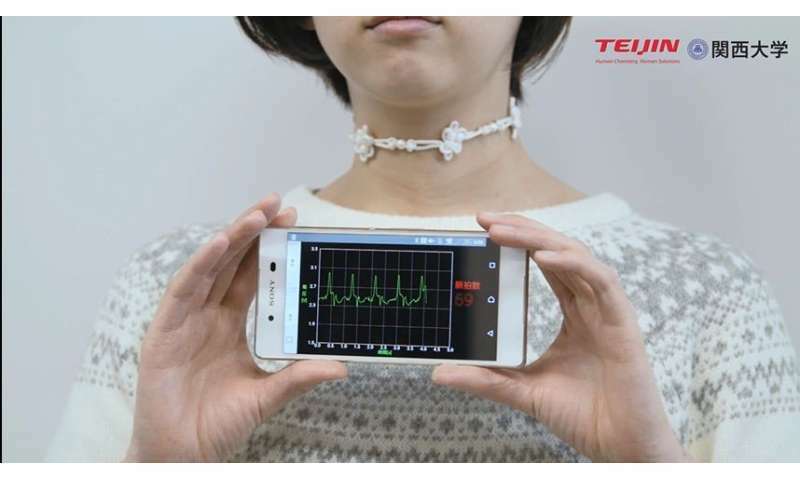 For example, Tajistu and coworkers have fabricated decorative necklaces with Kame and Kicchyo knots, which were successfully used to monitor the pulse rate due to pressure sensing of the carotid arteries on each side of the neck. Notably, the pulse signal was not affected by movements of the head or other parts of the body (Fig.4). "The subject does not feel any discomfort with the necklace, so it is a very useful portable device for monitoring healthcare," says Tajitsu. "In our experiments we transmitted the signals to smartphones by Wi-Fi. We have also made laces for shoes to monitor motion. So this is a fashionable and very powerful technology for wide ranging applications." Y. Tajitsu, "Piezoelectric Poly-L-lactic Acid Fabric and its Application to Control of Humanoid Robot", Y. Tajitsu, Ferroelectric, 515, 1 (2017).